The centerpiece of Hide-A-Way, around which the community is designed, is its chain of three scenic lakes. The southern lake is 7 acres, the largest middle lake is 148 acres, and the northern lake is 80 acres in size. 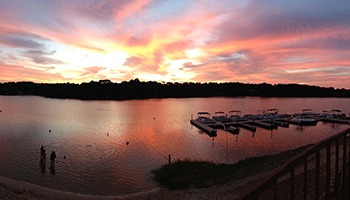 The lakes provide both great natural beauty and multiple recreational opportunities. Docks are available in four locations for mooring or fishing, and there are six boat launching sites to accommodate fishing boats, pontoon boats, sail boats, canoes, and other craft.